Jonathan Emmett is one of the finest children’s picture book writers at work today. 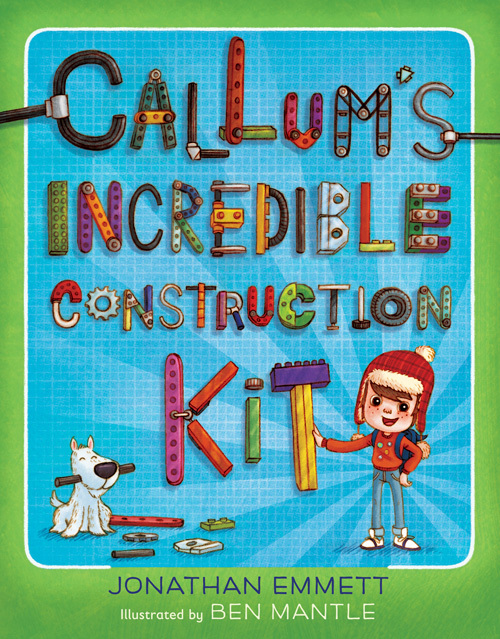 His most recent book, Callum’s Incredible Construction Kit (out now, £6.99, published by Egmont Books), is his 50th book. He kindly took time out of his busy schedule to answer my questions…. 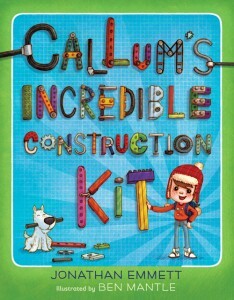 Andy Jamieson: What was the inspiration for your latest book, Callum’s Incredible Construction Kit? Jonathan Emmett: I’ve always loved constructing things and this interest has found its way into many of my stories, but my childhood enthusiasm for Lego is probably the main inspiration for writing Callum. Construction toys like Lego are a great way for kids to exercise their imagination by building miniature models, but imagine how much more fun it would be if the things you built were full-sized and actually worked. Another inspiration was the picture book Harold and the Purple Crayon by US author-illustrator Crockett Johnson, which has been a favourite of mine since childhood. In it, Harold uses a magic crayon to make drawings that come alive on the page. I wanted to write a story in which another child could do something similar, but in the real world. AJ: You’ve written so many books, a broad range of stories and styles – what is the secret behind your consistency? JE: Some books mean a lot more to me than others, but I try to bring the same level of care and attention to everything I write. If a book is going to have my name on the cover, I want it to be as well-written as possible. There are certain principles that I try to apply to all my stories, no matter what the style of writing. One is that a story should have a proper ending – I hate it when I’m reading a picture book and I only realise that the story has finished when I turn the page and find I’m at the back of the book. Sometimes my stories build up to an ending that the reader might anticipate, like Callum’s Incredible Construction Kit, and sometimes the ending can come as a surprise or even a shock, like The Princess and the Pig (which, despite the title, has a very un-fairytale ending), but both these endings are meant to bring a sense of closure to the story. Another principle I always apply, whether I am writing in prose or rhyme, is that the story has to read well aloud. Picture books are often read aloud, either by a parent (repeatedly if the book is their child’s favourite) or by a child that’s learning to read, so the text always has to scan well and be easy to interpret. AJ: What continues to drive you as an author? JE: The day after I was made redundant from my last “proper job” as an architect was our first wedding anniversary. This is the “Paper Anniversary” when you’re meant to give your spouse a paper gift, so my wife gave me a pop-up book. I know this sounds ungrateful, but I can remember looking at the book and thinking I can do better than that! And the following day I started making a pop-up book, on the strength of which I was accepted by the literary agent who got me my first publishing deal. That sense of ‘I could do better than that’ continues to motivate me, but it’s always counterbalanced by a sense of ‘I wish I could do something as good as that’. The latter is inspired in me by great picture books such as Maurice Sendak’s Where the Wild Things Are, Dr Seuss’s The Cat in the Hat or more recently, Julia Donaldson’s The Gruffalo, which is a perfect picture book story. Another thing that motivates me is the act of writing itself. As I’m writing one story, an idea for another often occurs to me, so there’s a domino effect. AJ: Your Owner’s Guide series, with illustrator Mark Oliver, are so detailed and superbly designed. After Monsters, and Aliens, do you have plans for any further releases? 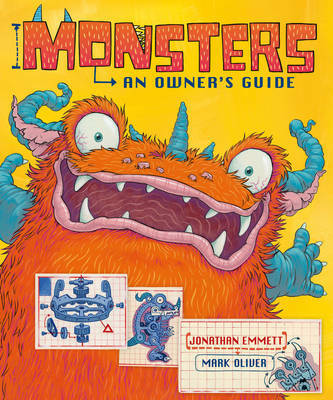 JE: I’m immensely proud of the two Owner’s Guides, partly because Mark and I got together and developed the idea for the first guide, Monsters, before taking it to a publisher. This meant we were able to work more closely than would usually be the case – people are often surprised to learn that author and illustrators often complete a picture book without ever having been in contact with each other, with the publisher mediating everything. I love the quirky humour and attention to detail Mark put into the illustrations for both books and we’d both like to work together again on something, but it probably won’t be another Owner’s Guide. AJ: What projects are you working on at the moment? JE: I’ve got several projects on the go at the moment, in various stages of development, either with or without a publisher. Poly Bernatene, the Argentinian illustrator of The Santa Trap is just finishing some stunningly atmospheric artwork for our third book, Here Be Monsters, a rhyming tale of dastardly pirates and ravenous sea-monsters. And I’ve just written what I hope will be our fourth book – although I’m not telling what it’s about! I’ve also just written a sequel to my funny farmyard tale, The Pig’s Knickers, which Vanessa Cabban is about to start illustrating. I’m currently pitching a monster-related series of stories to publishers along with a new picture book I’ve developed with Pigs Might Fly illustrator, Steve Cox. The book I’m doing with Steve is called Invasion of the Botty-Snatchers and, as you can probably guess from the title, it has a 50s sci-fi feel with a cheeky twist. I’m hoping to start work on a follow up to Callum’s Incredible Construction Kit at some point, but in the meantime I’m helping to adapt the book into an animated TV series. It’s still in the very early stages and TV projects are even more difficult to get off the ground than picture books, so it may never make it to the screen, but I’m enjoying working on the adaptation. The only thing I’m actually in the middle of writing is a young adult science fiction novel, but I’ve been working on it for five years and I’m only halfway through the first draft! AJ: How did you start out writing picture books? JE: I’ve always loved books and wanted to create them. The first publishing deal I had was for a pop-up book that I’d written, illustrated and paper-engineered (although the book was never published) and at that point I was trying to produce everything from board books to adult fiction. After I’d been at it for a couple of years, my agent, Caroline Walsh, gave me some excellent advice. She told me that, while there were many talented picture book illustrators, there were very few authors that could write good picture book texts, so if I wanted to make a living out of children’s books, I‘d do well to focus on this particular talent – which is what I ended up doing! AJ: Out of all the books you’ve written and worked on, do you have a favourite – one in particular that you are most proud of? JE: That’s a tough one and it changes from day to day, but right now I’d probably say The Santa Trap. 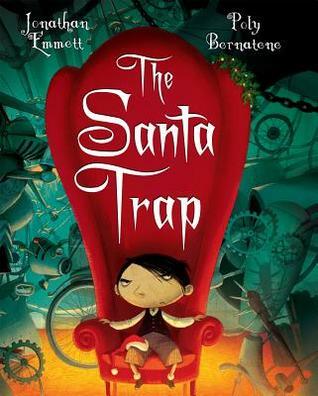 Although it’s about a villainous brat (which I like to think I wasn’t), it’s slightly autobiographical in that it’s partly inspired by the Santa traps I used to build as a boy. The story quickly found a publisher, but my personal attachment to it was one of the reasons I held out for three years for exactly the right illustrator, someone that could bring the right combination of delightful detail and dark humour to the illustrations. This turned out to be the fantastically talented Poly Bernatene, who, somewhat inconveniently, lives on the other side of the planet and does not speak English! It’s obviously a Christmas story and another reason I’m proud of the book is that I feel it’s a fresh and slightly subversive take on this very established genre. AJ: What do you read for leisure? JE: I have fairly broad tastes in reading. Dickens and Vonnegut are particular favourites but I read a wide range of both children’s and adult literature. I pity those pompous adults who say they wouldn’t be seen dead reading a children’s novel. Some of the most imaginative, engagingly written fiction I’ve read has been written for kids and some of the most pretentious, self-indulgent for adults – indeed this sort of fiction can only be written for adults as kids would not put up with it. One of the few authors who I think has written brilliantly for both children and adults in recent years is Neil Gaiman. I also read quite a lot of science fiction. One of the great things about being asked to take part in this year’s Edinburgh Book Festival was that I was able to catch Neal Stephenson’s event, since he’s one of my favourite authors. AJ: What are you reading at the moment? It’s not so much a novel as a set of interlinked stories each with a distinctly different authorial style, nested inside each other like Russian dolls. Each successive story steps forward in time with the outermost story set in the 19th century and the innermost in the far distant future. If this sounds too clever by half, let me reassure you that, as well as being technically brilliant, the book is very engagingly written. One of the most impressive things about the book is the two science-fiction stories at the centre of it, one set in a genetically-engineered dystopia, the other in a primitive post-apocalyptic society. Usually when “literary” authors try their hand at science-fiction the results are embarrassingly inept and unoriginal (Iain Banks wrote a great piece on this theme for the Guardian here) but both of the science-fiction stories in Cloud Atlas feel as if they were written by a genre veteran. It’s my favourite book since Neil Gaiman’s American Gods, which goes back a few years. Interview conducted by Andy Jamieson. Many thanks to Jonathan for his answers.